Apple announces new iPad, available March 16 | BlackBerry Blast! Apple CEO Tim Cook announced the new iPad today. It features an all new Retina Display with 2,048 x 1,536-pixel resolution. Apple says it's the best display ever to be on a mobile device. All iPad apps will be scaled up until new apps are written for the display. 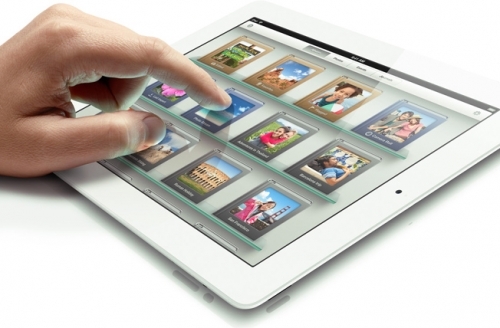 The new iPad will also feature Apple's new A5X chipset with quad-core graphics to support the Retina Display. It also sports a 5 megapixel rear camera with the same technology seen in the iPhone's camera, IR filter, autofocus and white balance, face detection, and 1080p HD video recording. As for wireless, it supports LTE 4G networking 72mbps, HSPA+ up to 42mbps. With LTE you'll get 9 hours of battery life, but up to 10 hours on 3G. The new iPad is 9.4mm thin and weighs 1.4lbs which is just slightly thicker and heavier than the previous iPad 2. Pricing is the same as the iPad 2, and Apple will keep the iPad 2 around for $399.